A new report from SweetIQ. Love them or hate them, online customer ratings and reviews are a fact of life for brick and mortar retailers . Sites like Yelp, Google+ and TripAdvisor influence 3x more sales than a brand’s own website. Nearly three quarters of customers are swayed by what they read in ratings and reviews, and their trust in online reviews is growing . Simply put: ratings and reviews matter to your brand. 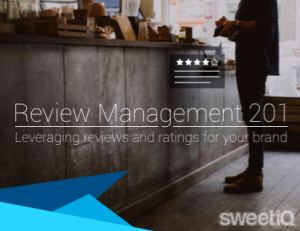 The bad news: most retailers don’t have a dedicated review management strategy. The good news: if you’re reading this, you’re one step closer to developing your own strategy and getting on top of your reviews.